I jumped at the chance to participate in the latest Craftaholics Handmade Gift Exchange – it’s like a pen pal…with crafts! I love this concept and the idea of sharing talents – and Linda hosts these exchanges twice per year, so you still have a chance to hop in later this year. I just received my craft pal’s gift and it’s perfect for me! Why? Because I don’t have the ability to make these in my own bag of DIY tricks, AND because I am always on the search for bookmarks! Her G-ma taught her how to make them. How cool is that…traditions rock! Now is the time to close the window if you are Sandy B. and haven’t received your packet yet – or keep your eyes open if you want a little sneak peek of what’s in the mail! 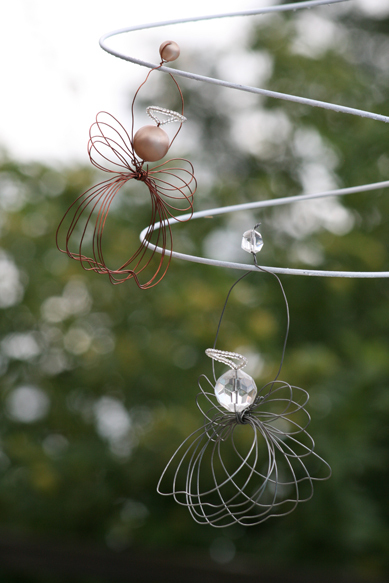 For Sandy, I made these sweet little wire angel ornaments. Yes, it may be a bit early for Christmas…but never too early to receive Christmas gifts! Make sure to check out Linda’s Craftaholics Anonymous blog and watch for the next round of the Handmade Gift Exchange. 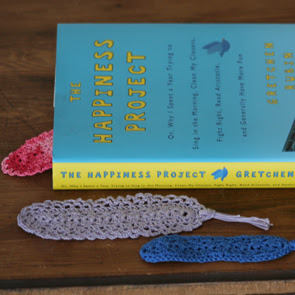 That is nice you are sharing your talent with us, and the book of 'HAPPINESS PROJECTS' seems great. Those are so pretty Michael!! I love them! I am featuring them tomorrow! thanks for joining the party! I loved seeing what everyone made! Oh those are adorable and I love the book marks. I participated this time too and loved it it was so much fun!